JERUSALEM � Israel, thought to be the Middle East's only nuclear power, has rejected a new U.N. call to come clean about its secretive nuclear program, calling it a "deeply flawed and hypocritical" act that ignores the threat posed by its sworn enemy Iran. Israel declared late Saturday that it would not take part in a 2012 conference on establishing a nuclear-free Middle East � an Arab-led initiative backed by top ally U.S. and the 188 other signatories to the Nuclear Nonproliferation Treaty. Although a series of U.S. conditions put the conference in doubt, the resolution, and the surprising U.S. support it received, added new pressure on Israel to give up what is almost universally believed to be a sizable nuclear arsenal. Israel refuses to confirm or deny the suspicions. Prime Minister Benjamin Netanyahu intends to discuss the resolution with President Barack Obama when the two meet in Washington Tuesday, the Israeli leader's office said. Netanyahu was traveling in Canada Sunday, and a government spokesman declined what contacts had been made with the U.S. over the resolution. But an Army Radio reporter traveling with Netanyahu in Toronto said his office unsuccessfully lobbied the U.S. to block the resolution ahead of Friday's vote. Israel's so-called policy of nuclear ambiguity is a cornerstone of its military deterrence. It has long said that a comprehensive Arab-Israeli peace must precede such weapons bans. Israel has never signed the non-proliferation treaty, which requires members to open nuclear facilities to inspection and to disarm. In its statement, it noted that since it's not a member, it is not a party to the resolution. "This resolution is deeply flawed and hypocritical: It ignores the realities of the Middle East and the real threats facing the region and the entire world," the government statement said. It "singles out Israel" yet "the terrorist regime in Iran, which is racing to develop nuclear weapons and which openly threatens to wipe Israel off the map, is not even mentioned in the resolution," it added. Despite its assertions to the contrary, Iran is widely suspected to be seeking to build nuclear weapons. Israel sees Iran as its fiercest threat because of its nuclear program, its ballistic missiles capable of hitting the Jewish state and Iranian President Mahmoud Ahmadinejad's repeated references to Israel's destruction. The Arab proposal for a Middle East free of weapons of mass destruction was first endorsed at a 1995 non-proliferation conference but never acted on. At this month's review of the treaty at U.N. headquarters, many delegates considered a conference to begin talks on a nuclear-free Middle East to be a critical part of the final resolution. The review's spotlight on Israel put the Jewish state in an uncomfortable position. While it tirelessly lobbies the international community to preventing Iran from acquiring atomic weapons, it insists on maintaining a veil of secrecy around its own nuclear capabilities. 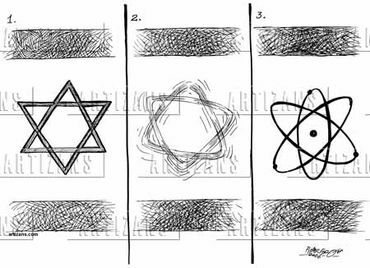 Details and pictures leaked in 1986 to the Sunday Times of London by Mordechai Vanunu, a former technician at Israel's Dimona nuclear plant, led foreign experts to conclude Israel has dozens of nuclear weapons. After Friday's vote, U.S. National Security Adviser Gen. James Jones said Mideast peace and full compliance by all countries in the region to their arms control and nonproliferation obligations "are essential precursors" of a nuclear-free Middle East. The compliance demand appeared to be aimed at Iran, which is a party to the nonproliferation treaty. Jones also faulted the resolution's decision to single out Israel while failing to mention Iran, which he said poses the greatest threat of nuclear proliferation in the region. A sticking point had been a passage naming Israel, reaffirming "the importance of Israel's accession to the NPT," a move that would require it to destroy its arsenal. On the other hand, the final document did not single Iran out by name as a member nation that has been found to be in noncompliance with U.N. nuclear safeguards agreements. Althout Israeli's policy fuels the problems in the Mideast, I think it's right in refusing a nuclear free treaty for the area. Hey, Sam . . . long time, no read. Good to see you posting! Well I think Israel has more than proven their hostile intentions to the neighbors. Yes, I found this news very concerning. Thanks for posting it, Sweetie! Iran, who has signed the NPT is condsidered the great threat and Israel, who refused to acknowledge that they have nukes is the golden child. "The Iranian authorities deny seeking a nuclear weapons capacity for deterrence or retaliation since Iran's level of technological progress cannot match that of existing nuclear weapons states, and the acquisition of nuclear weapons would only spark an arms race in the Mideast. " According to Ambassador Javad Zarif, "It is true that Iran has neighbors with abundant nuclear weapons, but this does not mean that Iran must follow suit. In fact, the predominant view among Iranian decision-makers is that development, acquisition or possession of nuclear weapons would only undermine Iranian security. Viable security for Iran can be attained only through inclusion and regional and global engagement." Iran's President Ahmadinejad stated during an NBC interview " Again, did nuclear arms help the Soviet Union from falling and disintegrating? For that matter, did a nuclear bomb help the U.S. to prevail inside Iraq or Afghanistan, for that matter? Nuclear bombs belong to the 20th century. We are living in a new century ... Nuclear energy must not be equaled to a nuclear bomb. This is a disservice to the society of man." By the way, Sam it is nice to see you back! Then Israel will cry about it's neighbors not wanting to recognize Israel. What if you had a neighnor who had enough arsenal to easily wipe out the whole neighborhood and has used a banned weapon(white phosphorous) by the Geneva convention against it's neighbors. The predictable Iran card is played; Israel stating that Iran is racing toward nuclear arms and wants to wipe Israel off the map even though Iran has repeated said it has no intentions of getting a nuclear bomb. Israel is going to keep it's nuclear arsenal because it intends on not pursuing the peace process, making further incursions on Palestinian lands, and leaving open the option of attacking Iran. I can't think of a more hypocritical stance a nation can take in regards to nuclear weapons. If I was an Arab country, I would either be making plans to get a nuclear weapon or be very suspicious of Israel's behavior. Especially in lihgt also of North Korean's provocative actions being stomached maybe because it possess it's own arsenal. You cannot currently send a star to Bob because you have done so within the last week. Another Criminal Act by Israel. Two peaceful activist are reported killed and thirty injured on one of the ships in the international peaceful flotilla sailing to Gaza. There can no longer be any doubt about WHO is the aggressor! How much more despicable can they get? These are peaceful, UNARMED civilians! Greta Berlin -- one of the organizers -- is quoting her lawyer that 10 people have been murdered on the ship while in international water. This is atrocious. Now our media and the U.S. state department will act clueless and surprised about this whole situation that could have been averted if the US simply demanded that Israel allow humanitarian aid to get into Gaza. AIPAC, My Dear, AIPAC. One day we'll get our independence from Israel! The white house should be contacted at www.whitehouse.gov/contact. I am sure they are aware of the situation. We have to let them know that we are aware. We should also demand that Israel is told to end all hostilities because the boats are in international waters. Will do, Terrance. Thanks for the link. Army radio intercepts: 10 dead. Do you think there is a minimum number of dead required to give the White House some backbone? The White house and the media is counting on our silence and not knowing what's going on. I went to CNN live and MSNBC and saw a brief write up and a few photo's. The ten dead unfortunately will force international attention. I guess Palestinians are destined to suffer at the hands of the Israelis. But for peace-loving people from all over -- who didn't have to be there, but chose to out of love and concern for humanity -- to pay the ultimate price that Palestinians pay day in and day out is just unfathomable. But out of a bleeding heart also comes more determination to NOT let other human beings down. Up to 20 dead , toll may be be more -convoy comms jammed by Israel. I think it's about time America stops giving Israel money for weapons as it'll all go on Newclear weapons and then the rest of the Middle East will suffer in the end, if we don't all suffer. Israel could quite easily turn onto us. And from what I've read there are Parlementarians on board those ships as well. What if Israel gets it's hands on them?? What is going to happen to them??? From which countries are they? Cyprus stopped their Parlementarians, so who else is on board? That would be a nice confrontation wouldn't it?. I'll keep on cruising between the 3 of you while I'm thinking of how to be polite and stern at the same time? First thing in the morning I'm going to write some e-mails here in Australia!!!!! Was reading an op-ed the other day and in it the person wrote an open letter to POTUS saying "Don't be nice to BiBi" on upcoming visit. I could concur more. Nukes are not the answer to problems. What bomb or act of violence has served to push the peace process forward....can think of none off hand. Just more dead, wounded and Israel is CREATING more "terrorists" with it's belligerant posture. Come on guys, Arabs started three wars against Israel, demand "Death to Israel' ( and "Death To America") on any outdoor activity, Iranian clerics agreed to have millions of Iranians dead as the price of attacking Israel, and someone can say with s straight face to Israel:"Disarm". Who would that be? When Arab states start behaving toward Israel in a peaceful and civilized manner, and prove their peaceful intentions by eliminating all hateful propaganda in their media, will stop provocations like Hamas support campaing, only then it would be a different story. There are many stories on here about the Israeli attack upon the aid vessel, please look them up and note them, this needs to get out to as many people as possible. And get VOCAL, write newspapers, call tv stations, write, call, email and fax the White House, this needs to get out to everyone in the world so even though it is in some press make sure you contact as many as you can and send some FACTS that they never tell about Israel and our support of what they are and have been doing..
Mark B- It is ignorant statements coming from people like you who keep fueling the murderous Israeli war machine. What does sending commando attackers on boats with unarmed, non-violent, peaceful international aid workers have to do with disarming Israel? Israel is nothing but a blood thirsty sick beast. Any moron could have simply misdirected those boats into another port. Israel wants to make a statement that it is not interested in any place talks. Israel relish excuses to use the weapons given to it by our government to murder innocent people in international waters. When have any Arab state or Iran deliberately murder anyone in international waters. Israel murders and assassinates people wherever it can find them if simply disagrees with Israeli criminality. "Prove their peaceful intentions". This is precisely when Israel attacks; when you are peaceful. "Only then it will be different". It will only be different when Israel is exposed to the world like Nazi Germany, The segregationist south, and south African aparthied. The next boat sent will contain 2,000 peace activist. They latest atrocity will only delay the day of reckoning for Israel. What kills me is the realization that I paid for those bullets that killed all these peace activists. I'm not asking other American to feel the same guilt, but can we at least work towards obtaining our independence from Israel? It was a lot easier when we dealt with the British! GENEVA – The UN Special Rapporteur for the Occupied Palestinian Territories, Richard Falk, urged Monday the international community to bring to justice those responsible for the killing of some 16 unarmed peace activist, when Israeli armed commandos stormed a convoy of ships carrying aid to Gaza. There are confirmed reports of lethal interference by Israeli military units on the high seas with the Freedom Flotilla of six ships carrying some 10,000 tons of medicine, food, and building materials to the civilian population of Gaza. Preliminary reports suggest as many as 16 unarmed activists were killed, and dozens more wounded. Richard Falk , Professor Emeritus of International Law at Princeton University and author of “Crimes of War: Iraq” and “The Costs of War: International Law, the UN, and World Order after Iraq” Also, current UN Rapporteur for Palestine. ISRAEL'S ACTIONS CANNOT GO UNANSWERED! Israel has used military force on the peaceful, humanitarian flotilla and murdered several unarmed civilians. This was not a confrontation, this was a massacre! The Emergency Response Plan is in effect. This includes emergency protests at all Israeli embassies (and beyond). Let Israel know that it cannot get away with its crimes against humanity! To find your nearest Israeli embassy, please click here. During his meeting with US Senator Robert Corker on Monday in Damascus, Syrian President Bashar al-Assad said that Washington�s support of Tel Aviv destabilizes the Middle East, the Syrian Arab News Agency (SANA) reported. This comes after at least 10 people were killed as Israeli commandos stormed a boat carrying pro-Palestinian activists bound for Gaza. Assad called on the US to �push Israel to stop its brutal assaults, lift the blockade of the Gaza Strip and move forward in the [Middle East] peace process,� SANA said. Corker said that it is important for the US to have good relations with Syria. The two men also discussed bilateral relations and the latest regional events during the sit down, SANA added. Obama: Join Nobel Laureates condemning Israel! This must be a turning point for U.S. policy toward Israel. Nobel Laureates from Nelson Mandela to Jimmy Carter and Aung San Suu Kyi have condemned Israel's brutal action. Where is Obama? A White House spokesperson stated that President Obama "deeply regrets the loss of life and injuries sustained." We need to hear a STRONG CONDEMNATION of this abominable attack, and it must be accompanied by action: an immediate cut off of all aid to Israel and sustained pressure on Israel to lift the siege of Gaza. Join us in calling on Obama to condemn the attacks!Pass it on to your friends and colleagues! Organize or join protests in your community against Israel's attack on the humanitarian flotilla. Call for the aid workers to be released and allowed to complete their humanitarian mission. Find events near you and post your event details here. For people in the U.S., call or sit-in at your elected officials' offices and demand that they condemn Israel, call on Israel to lift the siege of Gaza, and cut off all U.S. aid (learn more about the deadly impact of U.S. military aid to Israel ). Johnathan- You are the sick one to call most of us morons just because we take issue with Israel's racist policy's and war criminal actions. Here is why people compare Israel to nazi Germany.
. Substitute the post in defense of Israel with those in support of the Hitler Nazi regime and you would be hard pressed to tell the difference. Example: #1. Israeli are superior so we Israeli's have the right to inflict on the Palestinians, Arabs, and Americans any pain we want because we are great at computers, business, noble prizes, scientist, etc,. Sounds familiar to Hitler�s master race. Example #2: The dehumanization of everyone else except Israeli Jews. Our occupations, settlements, apartheid system, cooptation of America�s political system actually benefit those who we are imposing our will upon. Everyone should be elated that we are doing these things to them. Example#3: A racism that boarders on insanity. An unspoken and spoken racial arrogance that highlights the racial achievements of Israeli Jews and downplays the achievement of other's especially Palestinians and Arabs thus justifying murder, war crimes, and eventually genocide. Example #4: The use of the media to screen, dilute, and keep out any factual information that isn't advantageous to Israel's image that Israel wants to project. The propagandizing of the general public to only see Israel in a positive light. A one sided view of the conflict is maintained and enhanced to show the Palestinians as aggressors, when in actuality Israel commands a hugh disproportionate military advantage. Example #5:The strategic control and funneling of US financial resources to support Israeli military arms, use of technological resource from the US, the use corporations like Caterpillar, Motorola, and other corporations to dominate others who aren't Israeli's. Example#6: The use of false flag operations to get America to attack Israel's enemies in the Middle East. What entity besides the Israeli had the opportunity (countless Israeli involvement in NY city gov't and infrastructure), the intelligence (Mossad), US government Official( Neo-cons-Feif, Perle, Wolforitz, and other well placed neo-con Zionist within the US govt. apparatus) to pull 9/11. The immense planning and access needed to key facilities, equipment, technology, and personal was simply not available to a fictitious group or any group like Algaeda. Just because other countries mistreat their citizens doesn't give Israel the right to commit war crimes. This fellow, Johnathan, is either brainwashed or just a propagandist. If we can't take sides when murders are committed, then we are as morally deprived as the murderer. Thanks Terrance for trying to enlighten this fellow, but I'm afraid that you can lead a horse to the water, but you can make it drink. That was can't. But if you can that would be a miracle, especially with this guy. Sam, no horse must drink dirty water, even if you took it to the river. Jonathan, you are facing not morons a well coordinated Arab Media campaigners. Don't be surprised by the extremists views, that's how they were trained. The tragic deaths on Monday of nine civilians who were attempting to bring humanitarian supplies to the Gaza Strip is a grim reminder of the ongoing cost of the failure of Israelis, Palestinians, and the international community to achieve a lasting peace in the region. We at FCNL don't know the full details that led Israeli soldiers to kill those civilians, who were attempting to bring a boat loaded with humanitarian and construction supplies to the Gaza strip. We do know that the Israelis have kept Gaza closed since Hamas seized control in 2007 and Gaza desperately needs humanitarian relief. the cycle of violence can be expected to escalate without vigorous peaceful intervention. As the pro-Israel, pro-peace group J Street noted following this tragedy, the Israeli blockade of Gaza is not an effective way to increase the security of the state of Israel. FCNL has written to President Obama urging him to exert U.S. influence to end the blockade. That is not enough, though. Now, the United States should also put even more energy into ensuring that peace talks between Israelis and Palestinians succeed. Senator Dianne Feinstein (CA) has drafted a letter to Secretary of State Hillary Clinton calling on the United States to support direct, determined diplomacy for a two-state solution. The letter states, "We strongly believe that a permanent peace agreement - with two states, living side by side in peace and security- can only be achieved with the United States bringing the parties together and driving them to a settlement." Senator Feinstein has asked other Senators to co-sign this letter. Take ActionUrge your senators to sign Senator Dianne Feinstein's letter to Secretary Clinton calling for determined U.S. diplomacy to bring Israelis and Palestinians together and drive them to achieve a two-state solution in the Middle East. *If you are a resident of DC, we know you do not have senators to contact. You do have friends and family in other parts of the country, though. Please ask 5 friends to contact their senators. BackgroundRead FCNL's letter to President Obama on theGaza flotilla deaths and crisis. Read Senator Feinstein's draft letter to Secretary of State Clinton calling for deliberate diplomacy for a two state solution. See the J Street Statement on the Gaza Flotilla Tragedy. Contacting LegislatorsContact your members of Congress through FCNL's web site. Contacting the Administration Contact the President through FCNL's web site.